When trying to “go green”, it’s easy to grab the low-hanging fruit. Updated technologies and products, however, are now putting new ideas within reach. Owners and managers have been retro-commissioning (improving identified inefficiencies) and retrofitting (replacing old systems or equipment) for years. They’ve been installing everything from low-flow toilets and faucet aerators to integrated—and automated—systems that operate optimally both on their own and with other systems. All in an effort, of course, to both shrink their energy footprint and keep costs in check. Forward-thinking building owners and managers are further reducing their energy use by a significant amount these days, often through the use of new—or newer generation—technologies. Without a doubt, the perceived cost of implementation of some larger sustainable initiatives is preventing some from moving forward. But perception isn’t always reality. Not only can these initiatives give you a good return on investment, but in at least one case, energy efficiency can result in a brand new revenue stream that can mean thousands of dollars more in your bank account each year. With solar panels, there are three distinct approaches. This approach is very rare within cities with access to reliable power-grids. Remote communities without the same access may see this as a viable alternative. While the solar panels themselves have a relatively moderate cost, for an off-the-grid system to work reliably, a major investment in batteries is required so you can store the power for weeks or even months of limited sunshine. Off-the-grid systems will often use a combination of solar power and another generation methods such as geothermal, wind or micro-hydro. 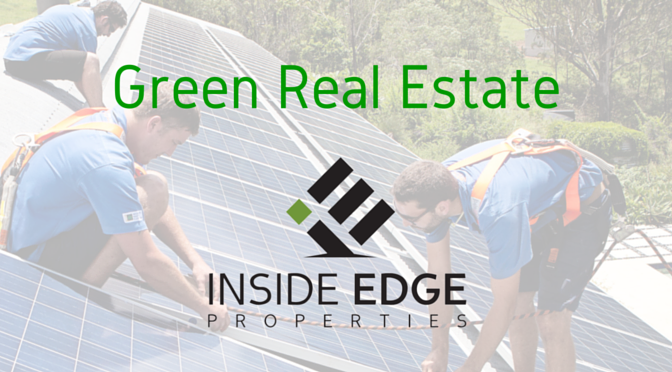 Investing in solar panels in certain instances can be the best option for a property owner as it creates a new income stream on a commercial or residential property. While purchasing solar panels has decreased in price significantly since 2010, there are still substantial installment fees that can be draining on a property owner. The average solar-panel system will come with a life expectancy of 25 years but panels always become less efficient over time and require regular maintenance and cleaning. Regardless of generous government grants, in the current Ottawa commercial real estate environment, the upfront costs are still slightly too high to warrant such a large-scale retrofit. That may change in the near future, however. This is the option that can actually make you money. Leasing your large rooftop on a commercial building to a third-party company can give you a reasonable return of around $.30 per square foot. Lease 50,000 square feet and that is $15,000 you didn’t have last year. And there are no installation costs. Due to its large environmental impact and potential cost savings, water management is an increasingly important green initiative, as well. While using less water has always been an option, some building owners and managers are going green by going grey. Grey water is water that is clean enough for cooling, sub-surface irrigation and other industrial applications, but is not necessarily safe to drink. In some buildings, upwards of half of the building’s water consumption is used to cool the air. Other usages, including toilets, for example, do not require potable water, either. The cost of treating that water, only to use it in those applications, is costly and seems unnecessarily wasteful. Grey-water systems take water from rain, drains and filters and disinfects it enough to be re-used. Typical grey-water systems for residential-sized installations cost around $5,000 while larger installations can cost 10 to 20 times that. Systems large and small can reduce water usage by 30–50 percent and pay for themselves in around 16 years, depending on usage. More good news is that a grey-water system can help a building earn more than 10 LEED points, enough to single-handedly secure a higher designation. Speaking of water consumption, with increasing water costs, sub-metering—a practice common in malls where, for example, food-court restaurants use much more water than clothing outlets—is also becoming popular among commercial-property owners and managers in an effort to share costs fairly. 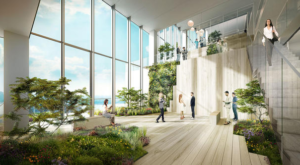 While the return on investment is harder to calculate, adding indoor green space has been shown to indirectly boost ROI by increasing worker productivity. Green-immersed employees, it has been found, can take up to 19 percent fewer sick days and work 6–12 percent harder. While massive green areas can be great idea’s for projects in the development stage, something as simple as adding a few plants around the office or the retail environments can increase morale significantly. Construction, deconstruction, renovation and normal occupancy in residential and commercial buildings account for one-third of Canada’s total energy use, 25 percent of landfill waste and 35 percent of greenhouse-gas emissions. With 500,000 commercial and institutional buildings across the country, small changes in even uncommonly used materials can have a large impact. Site selection can also have an impact. Positioning a building along a public transport corridor, for example, will significantly reduce the energy needed to get materials and people to and from the property. Locally sourcing materials can often go a long way to reduce the environmental impact of a global supply chain, as well. More than just the environmental benefits, sourcing products locally can reduce costs and may even result in tax breaks. Because each project—along with its challenges and opportunities—is different, it is often beneficial to implement an integrated design process (IDP) to achieve an optimally sustainable approach. An IDP simply means coordinating the efforts of the architects, engineers, developers and interior designers (who too often work in isolation). The idea is that collaboration will lead to more creative ways to maximize energy efficiency and reduce waste. We all want to make a difference—and save money. It is the wise developer who keeps his eyes on the marketplace. Because you never know what kind of new program, process or product is just around the corner.